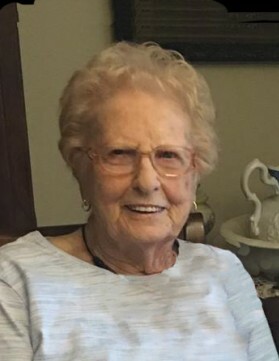 Alma Meyer, 91, of Falls City, NE, passed away April 4, 2019 at Lincoln, NE. She was born August 25, 1927 at Falls City to Carl and Caroline (Hahn) Weinert. She married Carl “Pat” Meyer on October 19, 1946 at Falls City. He passed away November 2, 1989. Alma was raised at Falls City and graduated Falls City High School in 1944. She worked for Gurske Law Firm before her children were born, but after having children she became a homemaker and stayed one her entire life. When married the couple established their home at Falls City and moved to Omaha in 1952, then to Odessa, MO until 1986, the couple moved to Big Lake, MO and in 1995 she move to Falls City and has lived here since. She was a member of First United Methodist Church and United Methodist Women at Falls City, Richardson County Humane Society and her Thursday coffee group. Alma is survived by her sons, Doug and his wife Shelley, Allen and his wife Brenda, Dwight and his wife Krista, all of Falls City, nine grandchildren, twenty-one great-grandchildren, three great-great-grandchildren, nephews and great-nephews. She was preceded in death by her parents, husband, brothers, Leonard and Howard Weinert, a sister, Dorothy Greenwood, a great-grandson, Gage Ramsey, and a niece, Cheryl Greenwood. Her funeral will be held on Monday, April 8, 2019 at 10:30 AM at First United Methodist Church with Reverend Young Je Kim officiating. Interment will be in Steele Cemetery.